COMPRESSION SOCKS- OR are these the new age IMPRESSION SOCKS? Gone are the times when Compression socks were viewed as medicinal products. We have mastered the art of combining fashion, technology and science to bring you the triple comfort without making you overpay. BLUETREE compression socks are designed to be the best amongst the market while providing a greater comfort with breathable and moisture absorbent material. THE IMPRESSION SOCKS - The smooth heel and toe provide unmatched comfort. We carefully designed and manufactured our compression socks to provide premium support, comfort, and relief without compromising your mobility. Form fitting, lightweight, and breathable fabric features maintain joint stability regardless of activity.Simplicity is the hallmark our socks. No complicated colors or design. it is ideal for those who sit for long period during travel or at work. COMPRESSION BENEFITS - Compression techniques are scientifically proven to provide relief of varicose veins, Calf Compression or other leg swelling issues. Usable throughout the clock, our socks help prevent Blood clots after surgery & Fits well unlike socks with inflexible fabrics. The compression & support is perfectly located on Heel Foot Calves and the toe area wont squeeze your aching toe joints. Instant comfort support. Moisture wicking properties rapidly air dry in a few hours. BEATING OUT THE COMPETITION -our knee high compression socks' material are upgraded with nylon percentage from 40% to 85%, Delivers 360-degree stretch for greater flexibility and durability. Breathable high performance fabric maintains an optimal temperature. Bacteria and moisture for maximum level of comfort. 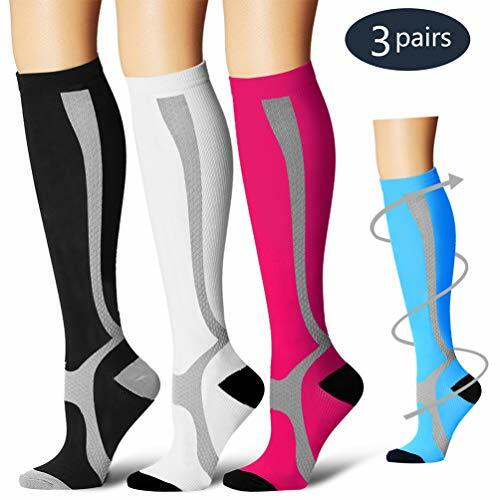 Our compression socks (15-20 mmHg) are recommended by doctors and preferred by trainers. No other offering on the market provides with such competitive price with same quality. If you have any questions about this product by BLUETREE, contact us by completing and submitting the form below. If you are looking for a specif part number, please include it with your message.